Note: This article is part of the StanGrad series highlighting Stanislaus State students who are part of the Class of 2018. Read more StanGrad profiles. 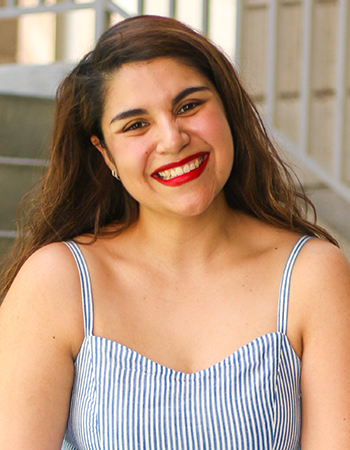 English major Monica Gudino found her calling in the pages of Renaissance literature. A rough beginning and health problems dogged her high school years, but at Stan State she has found inspiration and support and looks forward to her next chapter as a graduate student in English. “Initially, I had no plans to enter college. As a Hispanic, LGBT-aligned woman, I felt that I had nothing to offer the world of academia, and that people like me did not fit in higher education. I was wrong,” Gudino said. “During my time at Stanislaus State, I have realized that my personal experiences and alternative perspectives do not alienate me from academia, but make me an asset to it. If I can be of any inspiration to future or current students — especially minority or underprivileged students — I hope that I can simply inspire them to persevere, no matter how tough things get. There is a place for everyone in academia,” she said. Her professors commend her academic acumen as well as her perseverance. “You would never know that Monica has suffered a hard life,” said English Professor Anthony Perrello. “If you were to meet her, you would only see a smiling person with a friendly word for you. She has a sense of humor and she is easy to talk to. She never dwells on the negative, aside from perhaps not believing that she is as brilliant as she really is and that she has such an awesome potential to generate positive change. She has depth of understanding beyond the grasp of most undergraduates in our major and is headed for a master’s degree here at Stanislaus State and then on to a Ph.D. program."